The first thing that caught my attention on our drive to Ubud, from Nusa Dua in Bali were the lush green farms on either side of the roads. It looked so much like those fields back home. 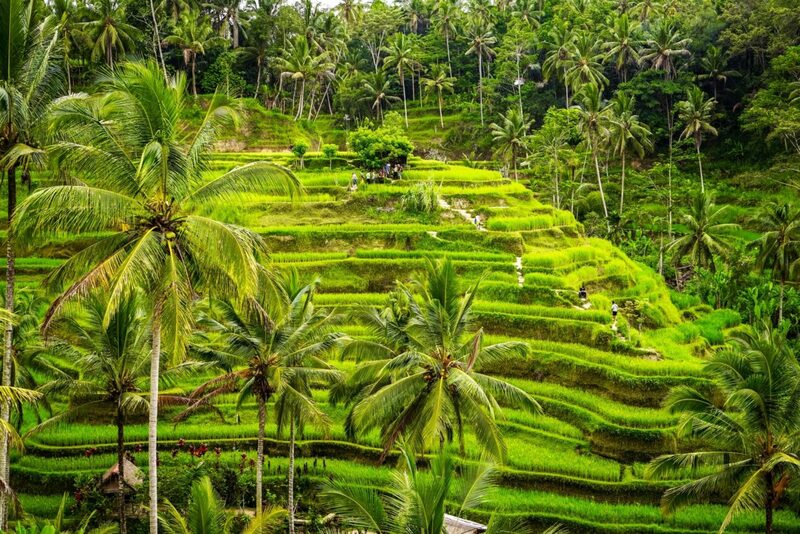 Cultivation is the prominent source of Income for the people of Ubud, after the handicraft industry of course. To me, Ubud looks like a total contradiction from the otherwise pompous places in Bali, like Denpasar or Nusa Dua. It was serene, and the countryside look of the town itself imposed a sense of rejuvenating feeling. We were greeted by the sight of locals going about farming on their lands and women doing the chores outside their homes. What caught my eyes particularly were the temples that spanned beside the streets. The temples are constructed in a typical Balinese style, with long roofs of the temple entirely tapering until the top. You can identify the role of the temple and their significance by their size and the grandeur which they adorn. The bigger temples are all beautifully decorated and looked more elegant for the fact that we’d visited Bali during the time of one of their prime festivals( similar to Diwali in India). I was more observant of the place than usual as I’d earlier heard from our guide about the inheritance of the Hindu culture in Bali. The fact that something as profound as a whole culture being borrowed from my motherland instilled pride in my heart. The icing on the top of the cake was the kind and the genuine welcome by the locals wherever we went – A full gesture of ‘Namaste’ with folded hands and a truthful smile as soon as they recognised that we were from India. It took me a while to get used to being in the spotlight for being an Indian and by the end of the trip, I’d practised paying back Namaste accurately, without forgetting! The locals fired us questions about the mythology or about how Delhi is( most of the people we met were familiar with only the capital city of India). It would often lead to some interesting conversations happening between us. The same thing followed in Ubud, as we pulled over at an art gallery. The art gallery is set up in a big mansion, albeit the luxury. A room dedicated to each of the categories of paintings and I found a room full of murals of Buddha very excellent. Also, follow me on Twitter & Facebook for my travel stories.